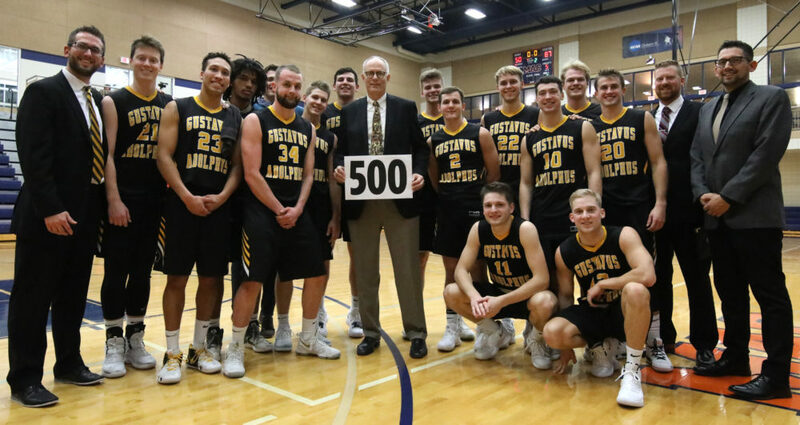 SAINT PAUL, Minn. – Gustavus Head Men’s Basketball Coach Mark Hanson earned his 500th career victory Wednesday night as the Gusties defeated Macalester 87-50. Now in his 29th season at the helm, Hanson becomes the 16th active NCAA Division III men’s basketball coach to reach the milestone with a record of 500-267. “This means I’ve been coaching a long time, and I’ve had some outstanding young men who have won a lot of games,” Hanson said modestly. Gustavus, now 3-4 overall and 1-2 in the MIAC, shot a season-high 59.4 percent from the field, making 38-of-64 shots, including 10-of-22 from beyond the arc. The Gusties had a strong inside game, out-rebounding the Scots 34-25 and outscoring the home team 42-10 in the paint. Nolan Malo (Fy., Owatonna, Minn.) had the best game of his young career, scoring 23 points on 10-of-12 shooting from the field, including three three-pointers. CJ Woda (So., Maple Grove, Minn.) added 14 points and a team-high six rebounds, while Riley Sharbono (Sr., Marshall, Minn.) and Vannis Smith (Jr., Crystal Lake, Ill.) contributed 10 points apiece. The Gusties made their first three shots of the game and never trailed. With 8:47 left in the first half, Gustavus took a 28-16 lead after three consecutive treys, forcing a Macalester timeout. The Scots fought back with a 16-6 run to make it 34-32 with 2:12 left in the half, but the Gusties extended their lead to 43-37 at the break. After halftime, the Black and Gold scored the first 10 points of the second half and continued to extend its lead throughout the rest of the contest. The second half defense was strong, allowing just 13 points in the final 20 minutes. Gustavus next hosts Saint Mary’s at 3 p.m. Saturday.